A few years ago I had decided to go natural…those who have gone through or are going through this journey know the sheer desperation that hits you when you realize that you have no idea how to handle your own hair. I googled all that I could, asked around, and finally heard through the grapevine that there was someone making and selling products specifically for natural hair… And that is how I first met Mariluz. Over the last 2 and a half years I have had the pleasure of seeing her grow not only her hair but also her business. What started with her selling her popular Flaxy Gel from home, has grown into a store that offers much more than just hair products. Naturals Curaçao now offers a wide variety of soaps, scrubs, lotions and oils, just to name a few. The majority of her products are made from scratch with materials imported from all over the world to ensure quality and diversity. So when time came to renew her contract, she decided she wanted out. The year that followed wasn’t an easy one for Mariluz. Finding another job seemed impossible, and so she began experimenting with different ventures. She loved cooking so she tried her hand at selling food. Selling clothes and accessories soon followed, but still nothing stuck. Nothing was going the way she wanted, so she decided to take charge and do something that she had always thought about: cutting her hair. Taking internships,her job and the opinions of others in consideration had stopped her from doing it before, but being unemployed gave her the chance and freedom to do it. 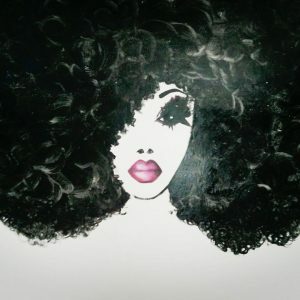 Although she had looked up hair care blogs and information online for a long time, at the beginning of her journey there was still a lot she needed and wanted to learn, so she made a group on Facebook to connect all the locals with natural hair. The idea was to have a place where they could all come together to share information, gain knowledge and also figure out where they could get the products they needed. Because these products were not easy to find on the island back then, Mariluz decided to start making her own as a hobby. She shared this with the group, and people started asking if she would make for them as well. The overwhelming amount of orders quickly convinced her that this could be turned into a business. An added bonus was that it was something that she genuinely enjoyed because it allowed her to express her creativity. This creativity comes through even in the names of her products, from plays on words to naming products after her beloved family members: everything is unique. According to Mariluz this is one of the keys to her success; She has stayed true to herself, and put her patience, passion and time into executing her ideas and she is constantly challenging herself to come up with different angles. Her advice to anyone who wants to start their own business is to simply do it. Make that jump! Because if you don’t, how will you ever get where you want to be? Having a bit of fear is natural… pardon the pun, but it shouldn’t get in the way of you going after what you want. Keep an eye out for the first ever Miss Natural Curaçao contest, and don’t be surprised if you bump into a Naturals Curaçao stand at events all around the island, Mariluz doesn’t play around. She is on a mission to not only help those on their journey with the right products, but also educate others that beauty comes in all forms and curl patterns. I hope her story inspires you, like it has inspired me.